Private message me in game. Mostly around 10.00pm - 11.30PM GMT+8 Singapore time. Buying Stylish Guerilla Bandana Design still. If anyone is selling, do private message me in game ( Azurelise ) if you can't reach me, drop me a mail, i'll get back to you. Just want to call out to any veteran players in Zulia (NA) server who might have ran sogun's lament or awaken necropolis previously in their mains or alts to check if they have the below item in their inventory/storage. if you do and willing to sell it, we would like to purchase it. Private message me or mail me should i not be in game or did not respond. 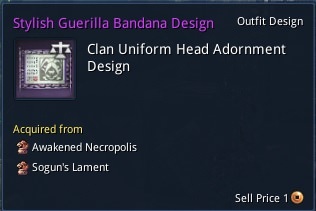 hope anyone who has ran Sogun Lament or Awaken Necro in the past can check your characters while opening trove to see if you have any of the stylish guerilla bandana design.